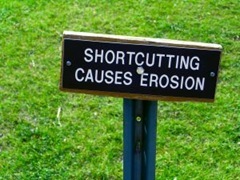 Is the Shortcut Worth It? EVERY ONCE IN A WHILE TAKING A SHORTCUT SEEMS TO BE HELPFUL. After all, we save a little time, stress and maybe a bit of money too … and taking a shortcut once or twice won’t hurt anything, right? And if taking the shortcut a few times in the past caused no negative results, why not avoid the long-road and just use the shortcut all the time? Perhaps in some instances a shortcut may yield a benefit but usually, particularly in the world of residential cooperatives, a habit of taking operational shortcuts can be treacherous and undermining. To show just how treacherous shortcuts can be, let’s take a hypothetical look at a case of shortcuts we encountered not too long ago. We were retained as consultants to a cooperative in which two opposing resident factions had evolved. Ignoring for the moment all the problems the warring contingents produced, in order to prevent a lawsuit threat from completely ripping the co-op apart we were asked to immediately determine whether the autocratic president had authority to make unilateral decisions while failing to convene meetings of the co-op board of directors. The out-of-power faction said the president did not have such authority though it was the in-power faction that retained and wanted the matter resolved. After several days of interviews and researching cooperative documents we learned the president relied upon a vote of the board taken one or more years ago granting him the ability to operate the co-op without further board action (the ability of the board to essentially abdicate its role was a separate question not addressed in this writing). Yet, the president had nothing in writing to support his claim. Previous and present board members seemed to recall some thoughts of conveying a few authorities to the president though memories of a specific board action in that regard, if any, were misleading and inconsistent. Co-op documents indicated the secretary was charged with producing written minutes and board resolutions that contained the actions taken along with yea/nay votes as well as the time, date and place of the vote. However, neither the current nor immediate past secretary had produced minutes or board resolutions, though they did have incomplete sporadic notes. They did not know where the minutes and resolutions of previous boards were kept or if they existed at all. When asked why proper documents had not been produced and maintained, the implication from their responses was minutes and resolutions weren’t really needed since nobody ever requested to see them. Evidently for several years the shortcut of keeping a few notes now and then made the secretary’s job easier and seemingly carried no consequence since no one missed the required documents and resolutions … that is, until the president’s authority was challenged. At that point the illusion of that easy shortcut came to a screeching halt. Want help to troubleshoot cooperative malfunctions? Feel free to contact us at InhouseCo@aol.com and place the words “Cooperative Help” on the subject line. This entry was posted on March 30, 2014 at 16:56 and is filed under Co-op, Cooperative. You can follow any responses to this entry through the RSS 2.0 feed. You can leave a response, or trackback from your own site. It’s not my first time to go to see this web page, i am browsing this site dailly and take good information from here every day.